Kids With Food Allergies, a division of the Asthma and Allergy Foundation of America, has many free resources for parents, schools, teachers and staff to use to prepare for the upcoming school year and keep students with food allergies safe. A Teal Classroom™ encourages being safe and inclusive for everyone with food allergies. Our Teal Classroom Kit contains resources for teachers and other staff to raise food allergy awareness at school. Download and share a copy with your school. Advance planning and a positive relationship are the keys to success in sending your child off to a new school. Find out how you can plan and what you can do to give the school to set your child up for a successful school year. What are 504 plans, IHCPs and ECPs? What are the laws that address the needs of students with food allergy in schools? Together we need to advocate to prevent, and swiftly deal with bullying of our children. Find out ways you can be proactive in dealing with bullying. Learn about the options available in the U.S., and things you should know before you get your prescription filled for school (including discounts). Planning for the end of the school year is a great way to make sure the next school year starts smoothly. This checklist can guide you on steps to take before summer break begins. Read how one teacher taught her students about food allergies using a simple activity. Download copies of the activity to share with your child’s teacher. This press release highlights a study that shows school staff is better prepared to handle anaphylaxis than they think. It also includes a video with some tips for planning ahead for food allergies at school. Use this list to encourage your child’s teacher to use non-food rewards in their classroom to keep children with food allergies safe. When Is a Child Ready for Self-Care of Anaphylaxis? Learn about factors to help you decide if your child is ready to self-administer epinephrine if they have an life-threatening allergic reaction. A Teal Classroom™ encourages being safe and inclusive for everyone with food allergies. Our Teal Classroom Kit contains resources for teachers and other staff to raise food allergy awareness at school. Share this guide with your school nurse or your child's teacher. Unexpected places you can encounter common food allergens, along with alternatives and precautions that can be used. New handout that you can print and distribute to answer common questions about food allergies for people who do not live with food allergies. AllergyHome.org offers online staff training to assist school nurses or their designees in school-wide food allergy education. Interactive online video modules and written materials are available. St. Louis Children's hospital, in collaboration with allergy experts from around the nation, created a free manual for schools to help schools create and adopt food allergy policies consistent with the CDC voluntary guidelines for managing food allergies in schools. Michael Pistiner, MD, MMSc, talks about how to prepare for the new school year while keeping your child with food allergies safe. The chat includes valuable information including what options of epinephrine are available and how to use them. Dr. Dave Stukus and Dr. Mike Pistiner discuss what forms you need to get from your doctor for managing your child's food allergies and asthma at school. What Is the Difference Between Self-Carry and Self-Administer? (July 2016) Dr. Dave Stukus and Dr. Mike Pistiner discuss the difference between allowing a child to self-carry their emergency medications versus being required to self-administer them. Registered dietitian Debra Indorato, RD, LDN, and blogger Keeley McGuire share creative, nutritious and inspirational lunch ideas. They give kid-friendly tips, such as using cookie cutters and building lunches around a theme. Dr. Gianine D. Rosenblum speaks about managing children’s anxiety related to food allergies. She zeroes in on the needs of specific age groups. She also describes coping strategies universal to any age. Dr. Rosenblum is a psychologist and a parent of a child with food allergies. David Stukus, MD, and Michael Pistiner, MD, MMSc, talk about preparing to send your child to school. 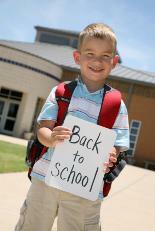 They also discuss how your allergist can help with back-to-school planning. Laurel Francouer, JD, presented the different options available for school health plans for students with food allergies, reviewed federal laws and definitions, and explained students' rights. A second webinar for Section 504 Plans Q & A was held in August 2014. School nutrition expert, author and speaker Dayle Hayes, MS, RD and KFA Nutrition Advisor Debra Indorato, RDN, discuss school meal regulations for students with food allergies; current thinking about food allergies in schools; the importance of establishing relationships with school food service directors, and more. Dr. Michael Pistiner of AllergyHome.org, and Sally Schoessler of the National Association of School Nurses, provide tips on how to work with your school nurse to set up a plan to keep your food-allergic child safe at school. Learn how you can contact your representative about the School-Based Respiratory Health Management Act, H.R. 2285, to encourage schools to stock quick-relief asthma medicines. The CDC created guidelines for schools and early childhood education programs to help them manage the risk of food allergies and severe allergic reactions in children. This is an annual report by AAFA to help identify states with the most comprehensive public policies supporting people with asthma, food allergies, anaphylaxis and related allergic diseases in grade schools. Find out how your state ranks. Find out why it is important that schools keep an undesignated supply of epinephrine to treat allergic emergencies that occur on school campus. A Section 504 Plan provides guidelines for changes in the classroom and other locations to provide a safe education. See four examples of existing Section 504 plans for students with food allergies. Laurel Francoeur, JD, presented the different options available for school health plans for students with food allergies, reviewed federal laws and definitions, and explained students' rights. A second webinar for Section 504 Plans Q & A was held in August 2014.